Here's a quirky thing in our bicycle culture here in Denmark. It's no surprise that January and February are the slowest months for the business of selling bicycles. What many - and I mean many - bike shops do is transform themselves into fireworks shops. In Denmark you're only allowed to sell fireworks between December 1 - 31 each year, in the run up to New Year's Eve. Bike shops are major sellers of the gear, like this one in the photo. Not only are January and Feburary slow months, there is also tough competition. A couple of years ago I counted 27 bike shops in my neighbourhood - with a 7 minute bike ride from my flat. That number is now 40+, as I've discovered more and more. Most bike shops are small and earn their wage repairing bicycles, more than selling them. 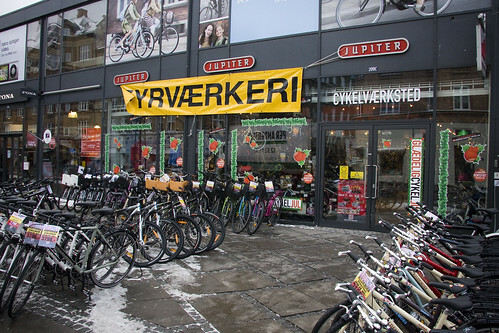 In January and February, even though 80% of Copenhageners cycle all winter, there are fewer people needing repairs. An innovative, unique way to muscle up the sales figures before the January drought. By all accounts, it's a similar story in the Netherlands and Belgium at this time of year. With all that said, me and the kids buy our fireworks at a local paint shop, who also morph themselves into a fireworks shop for the season.